Admittedly, I’m not so big a fan of Jane Austen or Austen-inspired fiction that I would normally pick up any book with a title that begins with “Pride and…”, but there was just something irresistible about John Kessel’s novel that called to me. Of course, the added element of Mary Shelley’s Frankenstein didn’t hurt. Still, although it may draw inspiration from one of two of the most beloved novels of classic literature, it would be a disservice to simply label Pride and Prometheus as just your average literary mashup. Not only has the author succeeded in capturing the tone, spirit, and style of these two works, he’s managed to create a perfect fusion of its deeper themes as well. Expanding upon Kessel’s 2008 Nebula Award winning novelette of the same name, the story begins with the chance meeting between an English high society woman and a young scientist from Switzerland. Mary Bennet, one of the sisters of Elizabeth Bennet of Pride and Prejudice, is persuaded to attend a ball by her mother, who is desperate to find marriage prospects for her two remaining unwed daughters. It is there that Mary first encounters the quiet and pensive Victor Frankenstein, who is in town with his friend Henry Clerval. Drawn to his intelligence and his shared love of the sciences and natural philosophy, Mary immediately strikes up a rapport with Frankenstein, but is disappointed when the scientist ends up standing her up for a dance, having slipped out of the party earlier without letting anyone know. The reason for Victor Frankenstein’s reticence and hasty departure is soon made apparent with the introduction of the Creature, a monster whom the scientist had brought to life and then cast out, appalled by what he had done. But now the Creature stalks him, driven by Victor’s promise that he would fashion a bride for him. He has followed his maker to England, growing impatient. Victor knows that until he has delivered on his promise, any new relationship would be impossible because no one around him would be safe. The first thing that jumped out at me was the writing. Kessel’s writing is absolutely gorgeous, emulating the style and manner of the original novels that inspired this tale, both of which were written in the early 19th century. As such, the language might take some getting used to, but gradually the story will ease you into the rhythm of the alternating viewpoints between Mary Bennet, Victor Frankenstein, and the Creature (who has dubbed himself Adam). I was also surprised to find that not only were the elements from both Regency Romance and Gothic Horror represented equally, they were blended perfectly. Granted, I was initially skeptical of the novel’s premise and the ambitious idea of throwing these two disparate genres together, but John Kessel managed to knock it out of the park. As for the story and characters, my feelings are a lot more complicated—but in the good way. For the most part, Kessel stays true to the personalities of Mary, Victor, and Adam, expanding upon them in a way that feels different without abandoning the essence of what makes them who they are. His version of Mary is especially sympathetic. As the middle Bennet sister, she is plain and bookish, much like Austen’s version. However, in Pride and Prometheus, she is a much deeper and contemplative character, and her love of the natural sciences (manifested as an interest in fossils) is genuine. Beneath her social awkwardness is also a caring and spiritual heart, even if she is sometimes driven by self-interest. Just as complex are the characters of Victor Frankenstein and his Creature, but because their tale closely mirrors that of Shelley’s original, I didn’t find them nearly as fascinating. Still, close to the end was a scene that filled me with so much anger and then with so much sorrow that I was almost driven to tears. All I’ll say about it is that, beyond the three main characters, there are a few others who I’ll never look at quite the same way again after reading this novel. All in all, I adored everything about Pride and Prometheus, from the utterly engrossing struggles of its characters to the emotional themes about obsession and attachment. 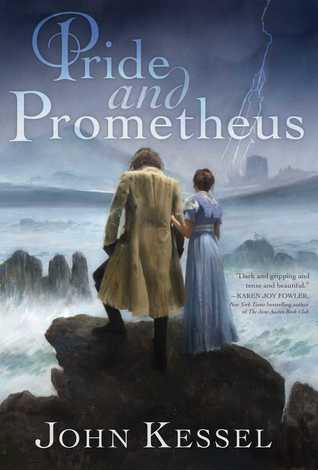 The book is also artfully written, and I think Pride and Prejudice and Frankenstein fans will be impressed with how well Kessel has captured the original novels’ forms and styles, even if it might make it more challenging for some readers to get into the writing. If you’re familiar with both classics, there will still be plenty of surprises, many of which I loved but couldn’t elaborate on in this review because I badly want prospective readers to discover these plot developments for themselves. This book endeared itself to me and then broke my heart, but all I could think about after finishing this was how I wanted more. Truly a treasure of a novel. Oh that’s fun! I think I would love to try this one! It looks perfect for me! So so good! I loved this too, he perfectly captures the style of these two authors. I’m going to have to go back and check out his other books now! I’m thrilled – this is the second great review I’ve read of this today. This is definitely going on my TBR! I loved Frankenstein. This is not something I would normally pick up, but you make me want to take a chance.